The Endgame will begin if the human race has shown that it doesn’t deserve to be human. All 12 Players of all 12 lines receive the message. All 12 Players of all 12 lines will attend the Calling. The Endgame is an apocalyptic game of alleged alien design. The Event will destroy everything. The winner of the Endgame earns survival. Survival for themselves and for every member of their line. Everyone else will die. 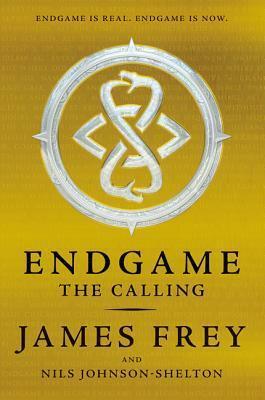 Endgame: The Calling by James Frey and Nils Johnson-Shelton comes out to today but it is more than just a book. 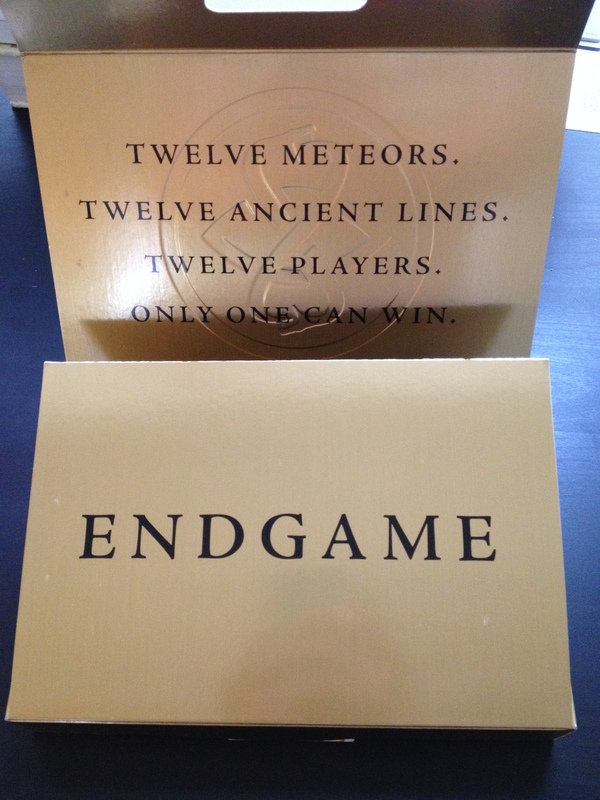 Endgame is a worldwide puzzle-based scavenger hunt for three hidden keys. Each book will feature a super puzzle comprised of clues and riddles layered into the text. My advance reader copy does not have these clues or riddles so I’m not sure what they look like or how hard they are. However, three MIT PhDs developed the puzzle, so I’m guess this won’t be a piece of cake. But if you solve the puzzle and find the key, it will open a bulletproof glass case with a massive pile of gold coins. Good luck. While I had no clue where this book was going chapter by chapter, I had a pretty good idea about how it was going to end and I was right. Like I said, I didn’t have the clues in my book, so I am not sure if that caused me to ‘miss’ something but overall I wasn’t thrilled about the writing. When I was reading it I was engrossed with the book but as soon as I put it down, I was over it. When I wasn’t reading it, I wasn’t even thinking about it. There was so much hype for this book at ALA and there might have been an Endgame to get a copy of the ARC in the fancy gold box, I was sorta disappointed that it wasn’t higher quality. 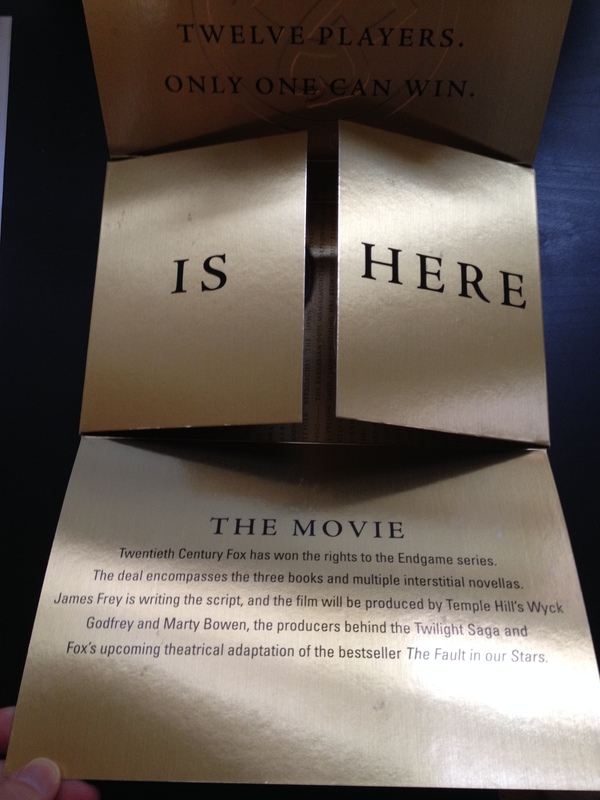 (I’m more impressed with the snazzy box than the writing.) In the end, I had to force myself to finish it, homework be damned, so that I could write the review for this by its publication. 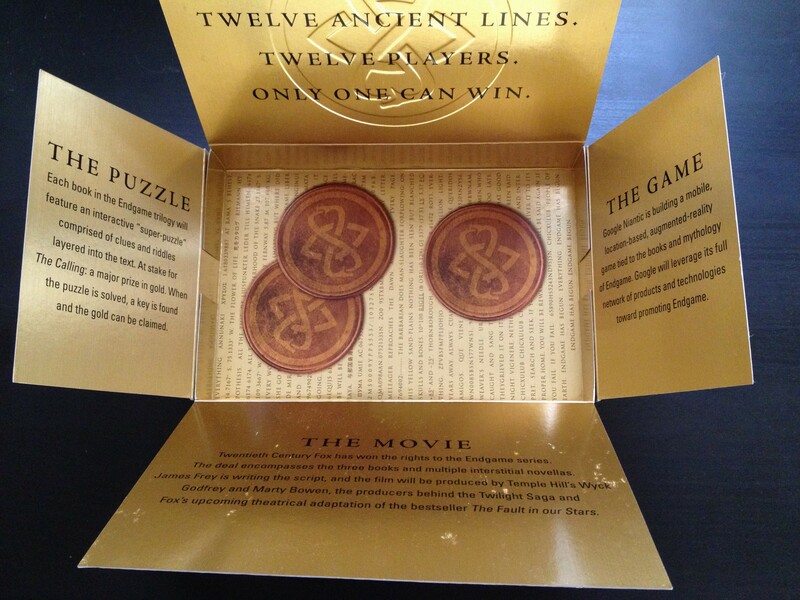 This book / gold coins puzzle is either going to be a colossal hit or a massive flop. Either way, Endgame has begun. You can read the 1st few pages for free here. This entry was posted in Fantasy, Post Apocalyptic, Science Fiction, Young Adult and tagged Endgame, Endgame: The Calling, James Frey, Nils Johnson-Shelton, Science fiction, Young Adult. Bookmark the permalink.